Three Dog Night made famous the song and phrase, "One is the Loneliness Number." I won't be using that as my mantra. Instead, I believe more in "The Power of One." My friend and fellow counselor, Jeff Ream, from the blog The Counseling Geek, started a Tell 1 Campaign to encourage counselors to join their State Associations and ASCA. I can say I already am a member of NYSSCA and ASCA and at a local level I am a member of TACA (or the Tompkins Area Counselor Association.) Membership at our local level has been sparse. Only a few members show up at each meeting. The meetings are so valuable. Information is shared about new graduation requirements, local programs, and community outreach services. Because, however, so much of the information was targeted to high school counselors (who also make up the largest percentage of membership) another middle school counselor and I decided to form a break off group focusing on K-8 counselors. 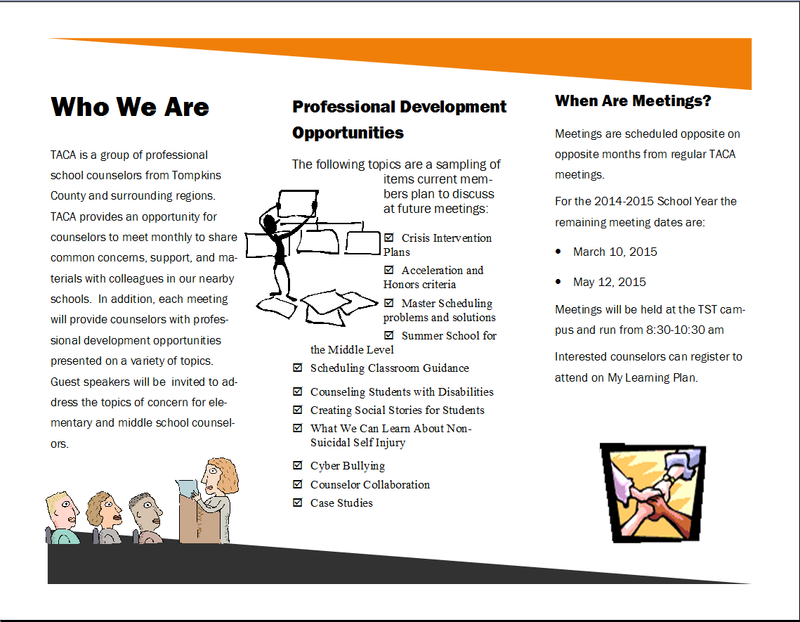 Our goal is go beyond our current local counseling association borders and invite a few more nearby schools. Since many of us are the sole counselors in our building, having a support group is important--sharing resources, look at case studies, discuss trends and even the students we often share. 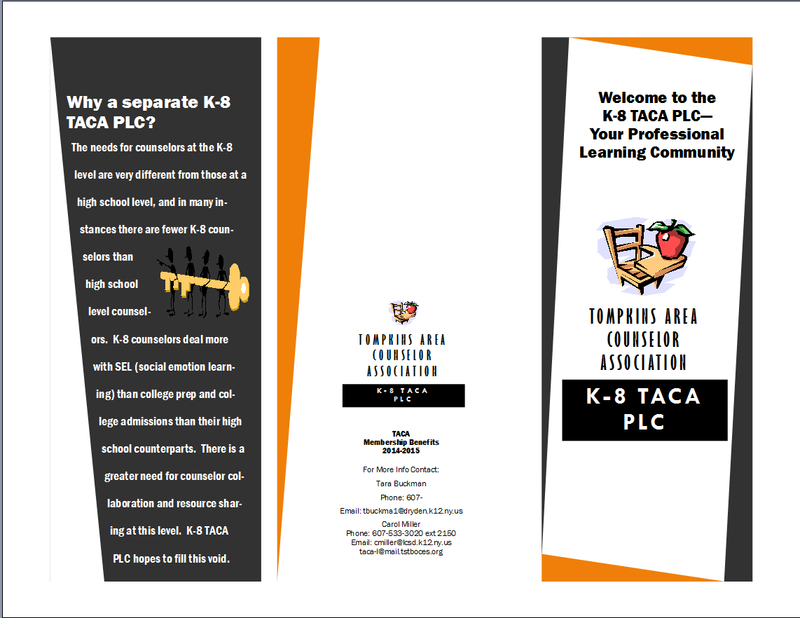 Here is the brochure we have put together to mail out to local schools and invite them to our new TACA K-8 PLC. So, I'd like to encourage you to "tell two friends" who will then tell two friends and so on. . . It's easy for counselors to say, "I'm too busy." or "I just can't get away." but these are excuses. Excuses that will lead to burnout, isolation, loneliness, professional insecurities of whether me made the right decision. I hear about counselors who feel isolated each day on Facebook. I witness the need for counselors to have a sounding board to turn to when they need a fresh idea or helping hand. "One" can be lonely, but it doesn't have to be. If you don't have a local organization be the Power of One. Be the one to start something, and while you're at it, tell a friend. Take the time; meet up with colleagues and find support, friendship, and ideas from each other. You'll be glad you did. As always our counseling groups are here to offer support, guidance and good conversation. Maybe you'll even find some counselors nearby that are ready to establish a face-to-face counselor organization in your area. It's suddenly happen only while using the grace of GOD. Without wish of our own creator we can't perform anything. I still remember i were implementing wefindthestuff.com project and by random search i see the song "one pound fish" this were also perhaps the most common man and after post its talent such gentleman become celebrity into nights.